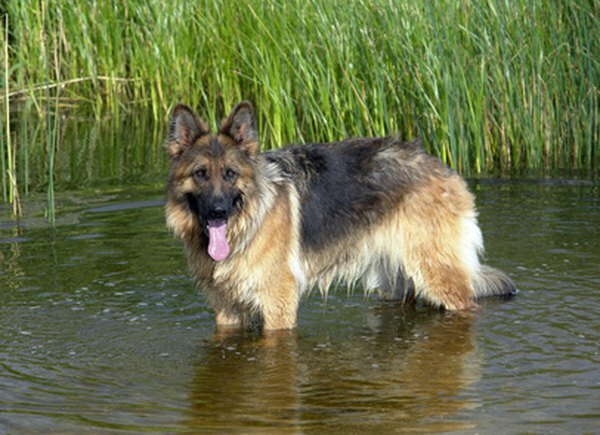 German shepherds have an exceptionally keen sense of smell that enables them to be excellent trackers. You can help your dog develop his tracking abilities for fun and companionship or to enter him in tracking competitions. He can even find your lost shoe for you. Take your German shepherd to a large grassy field, such as a baseball park. Arrive at the training area very early in the morning before anyone walks on the field. This eliminates scents of others in the grass, as well as distractions. Clip your dog’s leash onto his collar and either tie him in a place where he cannot see you or have a friend occupy him with him facing in the opposite direction of where you make a trail. Drop a few fragrant small dog treats on the ground about 6 feet from your dog. Squash the treats into the grass with your feet. Twist your shoes back and forth on the treats to pick up the smell onto your shoes and compress the grass to release its smell. Walk in a straight line away from your dog. Drop a treat into the grass about every 6 feet. At about 20 feet away from the beginning of your trail, place a clothing item that you wore, such as a sock, and place a dog treat on top of it. Walk perpendicular to your trail about 10 feet over and walk back to your dog. Either untie him or have your helper release him. If you are training him to track for fun, you can unclip his leash. Track training for contests requires you to leave the leash on him. Point your dog in the direction of the trail. He should go to the first area with treats, and then follow the scent tracking on your shoes to the next treat. Walk slightly behind him and encourage him with praise as he finds each treat. When he gets to the end of the trail, ask him for the item you left there for him to find. Repeat the same scenario several times. Make new trails that are longer and have curves in them after your dog masters the straight tracking trail. Make trails that cross over themselves into figure-8 shapes. Arrive at an area later in the day that has other scents on the ground so he has to ignore those and only find yours. Play the tracking game with clothing items of different people so he learns to track others. Limit training sessions to about 20 minutes per day. If your dog appears to have forgotten how to track after learning, stop the training for that day. His attention may have wondered or he may be tired. Eventually phase out the treats for a trail and only walk along it to teach him to track without treats. Give him lots of praise and attention for finding the item at the end of the trail.